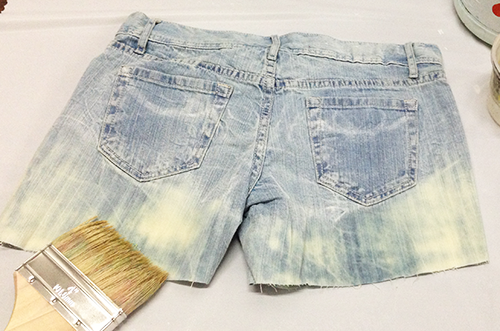 Use a wide painter's brush to add the 1 part bleach, 1 part water mixture to the bottom of the front and back of the jean shorts. Next cut out half moon eyes from paper that are the same width as your back top pockets. Also cut out a nose from the paper. Place on jeans. These areas will serve as resists for the spray dye. 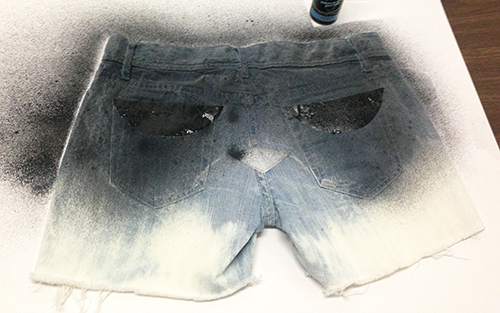 Now spray the top to middle portion of your jeans and lighten the amount you spray as you go. Let dry thoroughly, then remove paper before you start your painting. 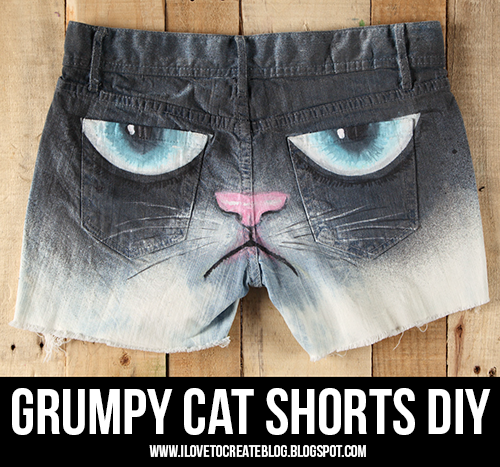 For the fronts, paint your cute cat paws coming out from your pockets. Snip some cuts below the claws to look like a grumpy cat scratch. You can further distress them with a seam ripper or some sandpaper to look like real scratches. Add a little of the black paint around the scratches to enhance those areas. 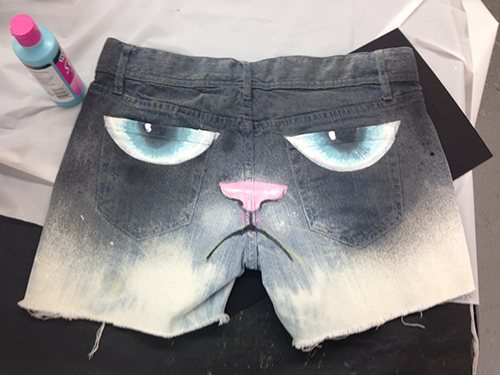 On the back, use white, black, pink, and blue soft paints to make the grumpy cat face. Fill in the entire semi-circle area with white Soft Paint first, then add in some blue paint for the iris area. Fan out with your paintbrush so it blends into the white area. Next make the pupil areas and add a spot of white for a little glare in his eyes. For the nose, fill it in with pink and highlight it with white. Outline the bottom of the nose black and continue down to make his grumpy scowl. Add some whisker spots using white with your liner brush, then create whiskers using the white and black paint. 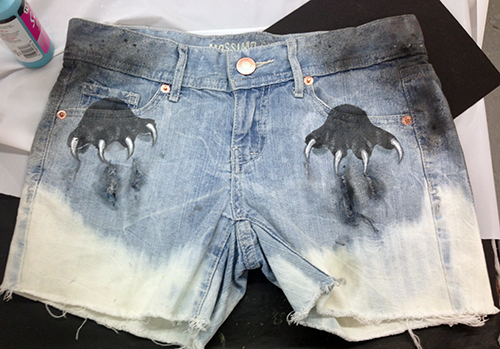 Here's how the front of the shorts turned out! Talk about cat scratch fever! 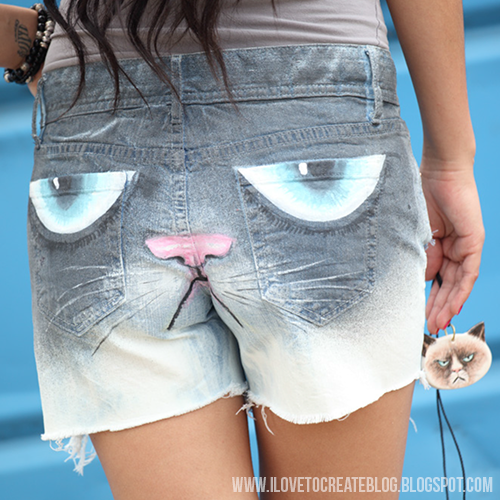 Here I paired the shorts with a ceramic Grumpy Cat necklace I made. Hahahahaha. At least she's honest. Can't..type...laughing to hard!!! Oh my gosh this was HILARIOUS! These are my new Favorite Thing! You rock! That is really really great. these. are. awesome. I totally laughed out loud, so much so, that I actually spelled out laugh out loud - instead of using the acronym. Can't even imagine the comments you would get. No thanks. :) Loooove it! So fun! So cute love the paws coming out of the pockets with scratch marks! i can try making this one. look at how perfect the lips fit when worn...tehee very nice result. Oh this is so cute. I am going to attend a beach party, this weekend. 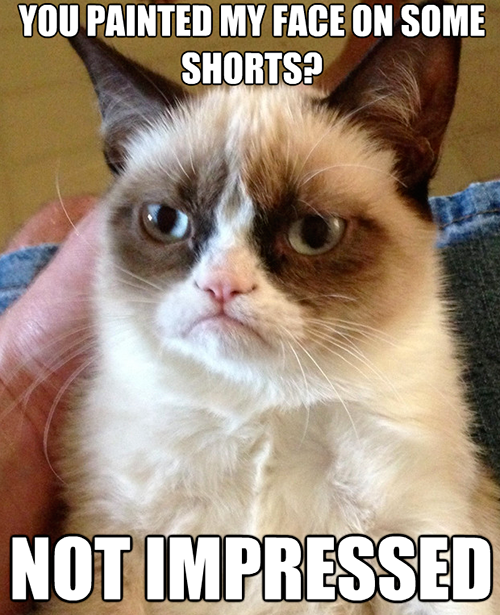 I think this is the perfect short to wear. 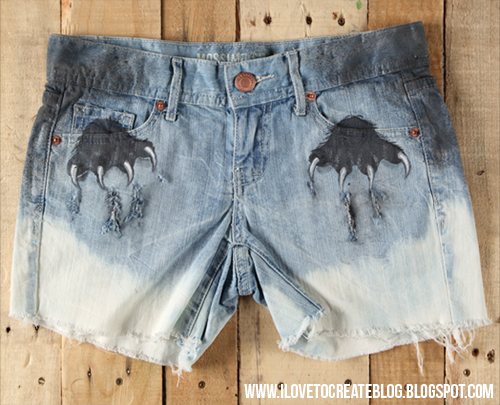 Please tell me if I can find similar pieces in collection of Brandy Melville shorts. This is so cute.Fantastic idea! I want to buy them!!! I would commission you to make me a pair. Interested? Thanks a bunch!